Recently I found my apartment facing two dilemmas. One, the weather is changing. This means, for me, my nose is going to dry out and cause me breathing problems and general misery. I can’t stand it. It affects me pretty terribly when I feel like that. Secondly, I was not sleeping very well. Anxiety and a sense of stuffiness in my apartment were compounding on top of a chronic insomnia situation I’m always struggling with. It was fairly aggravating, to say the least. In an attempt to battle these issues I tried a variety of different techniques. Sleeping with the windows open, exercising, over the counter sleeping meds, white noise, but nothing was fixing the issues with my environment. The closest to helping was when I got frustrated and slept in my car, but that was never going to be a permanent solution. A friend of mine who is a little “new-agey” recommended aromatherapy to me. That’s not really my bag, like at all, but at this point, I was willing to give it a shot. She gave me some essential oils, lavender, and eucalyptus, which I dabbed on my shoulders before bed. It relaxed me but I was still dealing with the dry nasal passages and the effects were short lived. Then there was a breakthrough which I am both reviewing and recommending here to you. An essential oil diffuser. 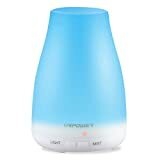 This is a device that combines aromatherapy and a humidifier. Specifically, we’re talking about theURPOWER Essential Oil Diffuser. I probably freaked my mailman out on this delivery. I tend to stalk the guy a bit when there’s something out for delivery. This time was no different, minus the fact that I was two days without sleep. Anyways, that’s another story. Sorry postman. The quality is pretty good on this device. I wouldn’t throw it around or anything, but it’s definitely not flimsy. It’s been running every night for the past few weeks, no issues with it conking out on me so far. Fingers crossed because this thing has been a life saver. My only with how it’s built is I did have some issues opening the water tank originally, it locks into place to stop spillage but it can be difficult to get open sometimes. Visually, it’s appealing. It has a color changing feature to fit the mood of the room and a bit of a Japanese look to it, which I like. My aesthetics are important to me. On the front, there are two buttons. One is for the power, press it once for intermittent misting or twice for a continuous spray. The other is for the lights, you can have those on or off. I use them sometimes, it reminds me a bit of the ambiance a lava lamp adds to a room. It comes with the oil diffuser, a charger, and a measuring cup for the water. No oil comes with the device, so make sure to order that alongside or pick them up elsewhere. What I’m getting at here is it is exactly what it says it is, nothing more nothing less. And that’s all you need. Add about two cups of water and two or three drops of your preferred oils, plug it in and let her rip. Seriously, this thing works well. The environment of my room was instantly transformed. I could feel myself relaxing, my sinuses loosening up, and the feeling of sleepiness wash over me. I fell asleep practically right then and there. Upon waking I noticed the device had shut off. That’s good because I slept about 12 hours. The automatic cutoff is great on it. It only lasts 6 hours on the intermittent mist mode or 3 hours on a continuous mist, but that’s plenty of time to get to sleep. The humidity is perfect for my allergies and the combination of lavender and eucalyptus, like my friend said, seriously helped out my mood. Plus, there’s no heat involved so it’s not warming up my room and increasing my summer electric bills. Sometimes, I wish it would be a bit more powerful on the mist but that’s more of an issue with the different oils I’m using. Add more to suit your tastes, just be careful they can get quite strong. I tend to not give rave reviews for everything I use. But this would be an exception to that. For the price point, just about $18 USD, it’s practically a steal and the use I’ve gotten from it is seriously saving my life. If you find yourself in a similar state I was in, that is dry and unable to sleep, I recommend this device a thousand times over. My only small complaint is I wish it lasted a bit longer than three hours on a continuous mist, but since I’m mainly using it to sleep I hardly notice this issue. There may be technically “better” diffusers on the market, but not at this price point. This is ideal for anyone looking to try new things out to help with relaxation and better overall sleep health. Depending on your need for such a device, your mileage may vary on how much you like it. But, for someone like me, this is one of the best purchases for improving my quality of life I’ve made in recent memory. It relaxes you and fixes dry sinuses. Go get one. Next Review: IK Multimedia iRig Acoustic – can an acoustic mic at this price be any good?